Guildline Instruments is an Engineering company that has been a premier designer and manufacturer of Metrology based Electrical Instruments and Standards to the world’s national and highest level commercial laboratories since 1957. 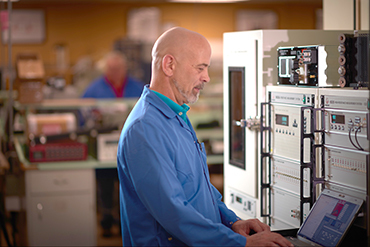 Our unique and innovative instruments are used for research; and for calibration and manufacturing support as the primary Standard with respect to establishing traceability to fundamental electrical standards. Guildline manufactures a broad range of Metrological Instrumentation including: Quantum Hall Systems, Resistance and Thermometry Bridges, High Resistance Meters/Bridges, Ultra-Stable DC High Current Sources, DC Current Shunts, DC Voltage Dividers/References, Resistance Standards (both DC and AC), Power Analyzers, Wide Frequency AC Current Shunts, Transconductance Amplifiers, Fluid/Oil Baths, Air Baths, and the most advanced Automated Measurement Systems with a broad range of accessory products. Guildline also builds the world’s best Salinometers! What sets Guildline apart from competitors is our innovative and strong Engineering and Research capabilities; and our commitment to the highest level of quality. In the past seven years, Guildline has been granted or filed for 23 patents related to the measurement circuitry for new instruments including the world’s best commercially available temperature and resistance bridges, DC and AC current sources, DC and AC current shunts, power analyzer and voltage divider. Guildline is the only manufacturer of electrical metrology instruments in the world that invests over 20% of total revenues into research and the development of new instruments. Our blend of design engineering and manufacturing craftsmanship is unique and is backed up by over 60 years of commitment to our customers. Guildline’s instruments provide our customers with the widest range, best accuracies, and lowest uncertainties of any manufacturer. For resistance, our instruments can measure a range from a 0.1µΩ to 10 PΩ. For current, the range of operation is a 100 fA to 10,000 Amperes. In voltage, the range is nV to 1000V. For temperature, Guildline’s products measure the range from -200 ºC to over 1000 ºC with accuracy and stability to 0.005 mK . Typically our Instruments and Standards provide parts-per-billion (ppb) or parts-per-million (ppm) uncertainties. Our world-class engineering team continues to introduce many new innovations into electrical metrology instruments such as an embedded Windows computer dedicated to running the user interface and providing world-class analysis and display functionality. Built-in automation features are provided for operation, calibration and use with third-party equipment. This functionality, along with world-leading accuracies and uncertainties, provides additional value to Guildline customers that is not matched by other electrical metrology companies. Key customer markets include National Research Laboratories, National Metrology Institutes, militaries, nuclear power plants, aerospace, and companies in the electrical and power industry. The sophisticated instrumentation and the subsequent ‘niche’ market required for ultra-precise measurements dictates that Guildline operates on a global level, even though we are headquartered in Canada. Most leading electrical and temperature research laboratories and national metrology institutes throughout the world use Guildline products. We have very strong quality control procedures in place and are accredited to the ISO/IEC 17025 standard. Guildline products are typically used for at least 20 years and some have been in operation for more than 50 years. In fact Guildline provides a full two year warranty for both the operation of our products and a guarantee that they perform within our manufacturer’s specifications. No other electrical metrology company provides customers with the same warranty and guarantee as Guildline. Performance and quality for over 60 years!